What’s the sign of a good recipe? My friends, this is that kind of recipe. And it’s for chocolate chunk cookies. 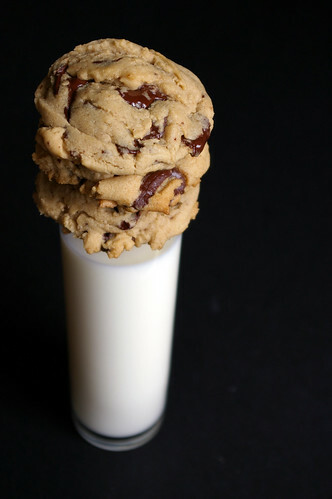 I didn’t think there was anything revolutionary about chocolate chip cookie recipes. (Barring, of course, the New York Times one that pretty much everyone has tried, except me. One day, I will try this. It’s the same day I have a fridge large enough to store a bowl of cookie dough for a minimum of 24 hours. One day.) I was mistaken. These are chewy delights of soft cookie with melty bits of dark chocolate. They are cookie perfection. I just really wanted to make some cookies one night last week, but had not put any thought into what kind. I innocently tweeted out I had a hankering to bake and my friend Robyn suggested I make these cookies from Anna Olson. I was intrigued by the addition corn starch, which Olson says gives the cookies a chewy centre. And, perhaps more importantly, I knew I had all the required ingredients, including an assortment of dark chocolate bars that I wasn’t quite sure what to do with. One of the ones I ended up using was a more traditional thin, flattish bar, while the other was about a 1/2-inch thick. I used my awesome cookie scoop to portion out the dough, which made these nice rounded, perfectly portioned balls of dough. What surprised me when they baked, though, is that there really wasn’t very much spread. They remain nicely thick and I’m sure that contributes to the chew. I ate a couple that night, then took some in for work where people devoured them. So, when it came to attending my first tailgate on Saturday (I know, I know, but I’m from Vancouver; we’re not really tailgate people), I knew exactly what I wanted to bring. And not just because I really wanted to eat some myself. But, yeah, that was part of it. This time, I used two flat, thin bars of 70 per cent dark chocolate. I broke them into smaller pieces with my meat tenderizer. Let me tell you, that was oddly satisfying. And the end result was really nice. The pieces melted into strata of cookie and oozing chocolate. It was heavenly. 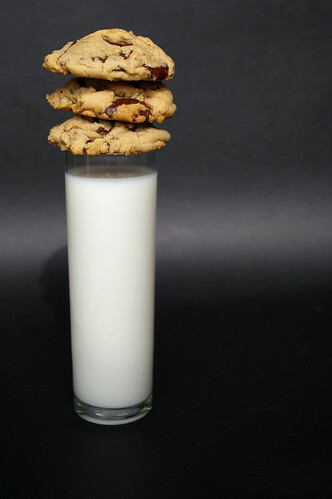 And for that, this is my new go-to cookie recipe. This is, essentially, exactly as Anna Olson dictates, but I’ve made a few changes to the instructions and called for dark chocolate instead of bittersweet. Cream butter and both sugars until smooth. Add egg and vanilla and blend in. In a separate bowl, whisk together flour, cornstarch, baking soda and salt. Add to butter mixture and mix until just blended. 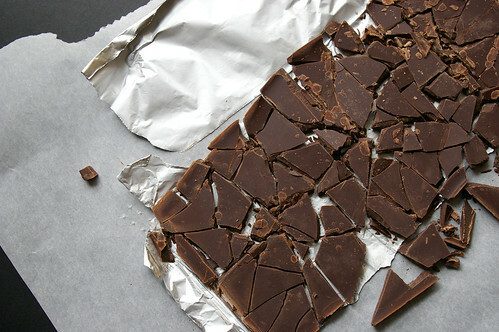 Fold in chunks of chocolate. Line baking sheet with parchment paper. 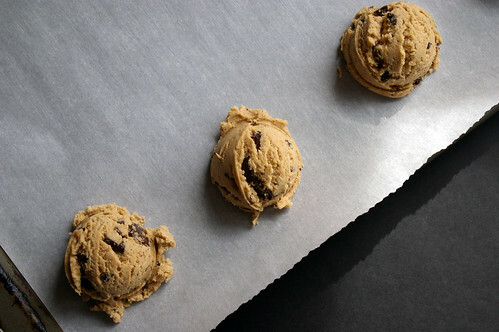 Drop cookie dough by spoonful onto the lined sheet and bake until just golden brown around the edges, between 8 and 10 minutes. i love cookies. especially chocolate chip ones. awesome photos. will have to try this recipe one night. Well this might tempt me to try a new recipe… I’m rather addicted to the one I got from Jennifer Perillo. These look deadly! Great photos, too. i’m so happy you like the recipe! i’m drooling just looking at the pictures! Cornstarch! 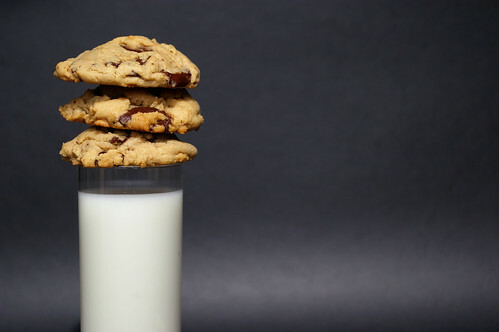 That’s been rumoured to be one of the secrets to the Levain bakery cookies in NYC. These look amazing. How big was the cookie scoop you used? I just measured it and it’s a full tablespoon, which really doesn’t sound like much but produced a nicely sized cookie. SO TOTALLY DIVINE looking! Cornstarch – never woulda thunk it! Going to definitely give these a try.. for research purposes of course! I’ve been making these for years. And they are always, always a favorite of people. They are soft and chewy and stay that way for days. These are even delicious a little bit frozen. Frozen, eh? I will definitely try that with the next batch. Thanks for the tip! They look fabulous. 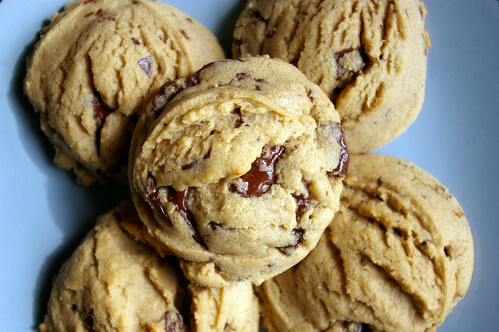 I’ll always try a new chocolate chunk cookie recipe, with dark chocolate is even better! Wow, those look amazing! Definitely one of the first things I’m going to bake when I get my new oven. Love the black background! Gorgeous photos. These are next up on my baking list. Amazing pictures. 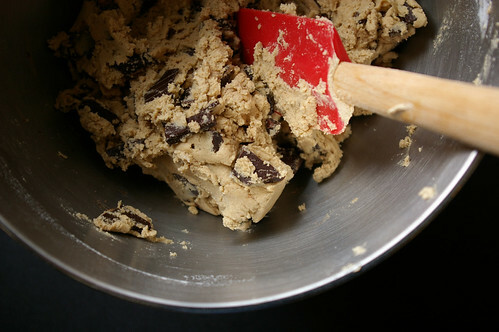 I think I’ll bake some cookies tonight. My goodness! Why aren’t these in my belly right now? I’ll have to change that soon and make a batch. Or three. Just found your blog thru dinner with Julie–love everything about it. Therefore, I was distressed to read in the archives that your banner didn’t meet with everyone’s approval. I think it’s great:) In the same entry, you talked about Dream Bars. There’s a very similiar sounding recipe called Dream Bars in Susan Mendelson’s Mama Never Cooked Like This. If you like, I’ll send the recipe to you. 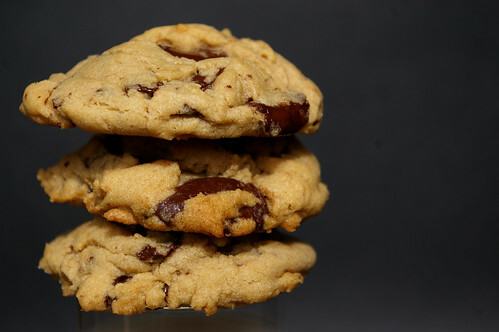 And the dark chocolate chunk cookies — awesome!! I love your blog, photos are wonderful. The cookies are absolutely fabulous! I love the way they taste and the great smell that they leave in my house when they’re in the oven! Thank you for the recipe! I think these cookies would probably travel quite well; what a nice treat if you send them to your son! As for lighting, I use nothing other than natural sunlight. I shoot most of my food by my living room window! I’m not good with flash lighting, though it’s something I need to work on now that the days are shorter. I know there are some other blogs that talk more about lighting; a quick Google search should bring them up. Good luck! Just thought I’d finally comment on these – today I will be making them for the fourth time. 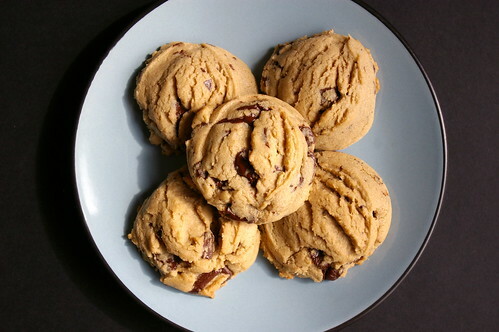 These really are amazing, and this has become my go-to chocolate chip cookie recipe. Last time I made them the entire batch got eaten within the day. Thanks so much for the recipe! I’m salivating as I read this recipe, and almost sorry I missed out on work that day. Thanks Gwendolyn! I have been living outside of the US for six years and really crave chewy chocolate “chip” cookies from time to time. These have become my go-to recipe. Sometimes I add chopped pecans, and I generally use one dark chocolate bar and one milk chocolate bar, and/but they’re perfect the way they are!